Production: Warner Bros. Pictures, Inc.; black and white, 35mm; running time: 102 minutes. Released November 1942. Filmed at Warner Bros. studios. Producer: Hal B. Wallis; screenplay: Julius J. and Philip G. Epstein and Howard Koch, contributions by Aeneas Mackenzie and Hal Wallis among others, from an unpublished play Everybody Comes to Rick's by Murray Burnett and Joan Alison; photography: Arthur Edeson; editor: Owen Marks; sound: Francis J. Scheid; production design: Carl Jules Weyl; set decoration: George James Hopkins; music: Max Steiner; songs: Herman Hupfeld and M. K. Jerome; special effects: Laurence Butler and Willard Van Enger; costumes: Orry-Kelly (gowns); technical advisor: Robert Alsner; opening montage: Don Siegel. Cast: Humphrey Bogart ( Rick ); Ingrid Bergman ( Ilsa Lund ); Paul Henreid ( Victor Laszlo ); Claude Rains ( Captain Louis Renault ); Conrad Veidt ( Major Strasser ); Sydney Greenstreet ( Senor Ferrari ); Peter Lorre ( Ugarte ); S. Z. Sakall ( Carl, a Waiter ); Madeleine LeBeau ( Yvonne ); Dooley Wilson ( Sam ); Joy Page ( Annina Brandel ); John Qualen ( Berger ); Leonid Kinsky ( Sascha, a Bartender ); Helmut Dantine ( Jan ); Curt Bois ( Pickpocket ); Marcel Dalio ( Croupier ); Corinna Mura ( Singer ); Ludwig Stössel ( Mr. Leuchtag ); Ilka Gruning ( Mrs. Leuchtag ); Charles La Torre ( Tonelli, the Italian officer ); Frank Puglia ( Arab vendor ); Dan Seymour ( Abdul ); Lou Marcelle ( Narrator ); Martin Garralaga ( Headwaiter ); Olaf Hytten ( Prosperous man ); Monte Blue ( American ); Paul Pracasi ( Native ); Albert Morin ( French offcer ); Creighton Hale ( Customer ); Henry Rowland ( German officer ); Richard Ryen ( Heinz ); Norma Varden ( Englishwoman ); Torben Meyer ( Banker ); Oliver Blake ( Blue Parrot waiter ); Gregory Gay ( German banker ); William Edmunds ( Contact ); George Meeker ( Friend ); George Dee ( Casselle ); Leo Mostovoy ( Fydor ); Leon Belasco ( Dealer ). Awards: Oscars for Best Film, Best Director, and Best Screenplay, 1943. Epstein, Julius J., Philip G. Epstein, and Howard Koch, Casablanca: Script and Legend , edited by Koch, New York, 1973; also in Michael Curtiz's "Casablanca," edited by Richard Anobile, New York 1975. McCarty, Clifford, Bogey: The Films of Humphrey Bogart , New York, 1965. Michael, Paul, Humphrey Bogart: The Man and His Films , Indianapolis, 1965. Warner, Jack, My First 100 Years in Hollywood , New York, 1965. McBride, Joseph, editor, A Collection of Film Criticism , Madison, Wisconsin, 1968. Quirk, Lawrence J., The Films of Ingrid Bergman , New York, 1970. Barbour, Alan G., Humphrey Bogart , New York, 1973. Brown, Curtis F., Ingrid Bergman , New York, 1973. Canham, Kingsley, Michael Curtiz, Raoul Walsh, Henry Hathaway , London, 1973. Parish, James Robert, and Michael R. Pitts, editors, The Great Spy Pictures , Metuchen, New Jersey, 1974. Baker, M. Joyce, Images of Women in Film: The War Years 1941–45 , Ann Arbor, Michigan, 1980. Francisco, Charles, You Must Remember This: The Filming of "Casablanca," Englewood Cliffs, New Jersey, 1980. Pettigrew, Terence, Bogart: A Definitive Study of His Film Career , London, 1981. Rosenzweig, Sidney, Casablanca and Other Major Films of Michael Curtiz , Ann Arbor, Michigan, 1982. Taylor, John Russell, Ingrid Bergman , London, 1983. Ray, Robert B., A Certain Tendency of the Hollywood Cinema 1930–1980 , Princeton, New Jersey, 1985. Winkler, Willi, Humphrey Bogart und Hollywoods Schwarze Serie , Munich, 1985. Eco, Umberto, Faith in Fakes , London, 1986. Kinnard, Roy, and R.J. Vitone, The American Films of Michael Curtiz , Ann Arbor, Michigan, 1986. Leamer, Laurence, As Time Goes By: The Life of Ingrid Bergman , New York, 1986. Fuchs, Wolfgang J., Humphrey Bogart: Cult-Star: A Documentation , Berlin, 1987. Jarvie, Ian, Philosophy of the Film: Epistemology, Ontology, Aesthetics , New York, London, 1987. Harmetz, Aljean, Round Up the Usual Suspects: The Making of Casablanca—Bogart, Bergman, and World War Two , New York, 1992. Lebo, Harlan, Casablanca: Behind the Scenes , New York, 1992. McArthur, Colin, The Casablanca File , London, 1992. Miller, Frank, Casablanca: As Time Goes By, 50th Anniversary Commemorative , Atlanta, 1992. Siegel, Jeff, The Casablanca Companion: The Movie and More , Dallas, 1992. Robertson, James C., The Casablanca Man: The Cinema of Michael Curtiz , London, 1993. Osborne, Richard E., The Casablanca Companion: The Movie Classic and Its Place in History , Indianapolis, 1997. New York Times , 27 November 1942. Variety (New York), 2 December 1942. The Times (London), 13 January 1943. Cooke, Alistair, "Epitaph for a Tough Guy," in Atlantic Monthly (Boston), May 1957. Luft, Herbert, "Peter Lorre," in Films in Review (New York), May 1960. Stein, Jeanne, "Claude Rains," in Films in Review (New York), November 1963. Dienstfrey, Harris, in Film Culture (New York), Fall 1964. Nolan, Jack Edmund, "Michael Curtiz," in Films in Review (New York), September 1970. Sarris, Andrew, in Village Voice (New York), 8 January 1970. Kinskey, Leonid, "It Lingers Deliciously in Memory as Time Goes By," in Movie Digest , September 1972. Vernhes, M., in Cinéma (Paris), March 1973. Day, B., "The Cult Movies: Casablanca ," in Films and Filming (London), August 1974.
" Casablanca Revisited: 3 Comments," in American Film (Washington, D.C.), October 1976. Rubinstein, L., in Cineaste (New York), Summer 1977. McVay, D., in Focus on Film (London), 30, 1978. Greenberg, J., "Writing for the Movies: Casey Robinson," in Focus on Film (London), April 1979. Hanson, Stephen L., in Magill's Survey of Cinema 2 , Englewood Cliffs, New Jersey, 1981. Ross, C., "The Great Script Tease," in Film Comment (New York), November-December 1982. Sigal, Clancy, in Listener (London), 12 July 1984. Eco, Umberto, " Casablanca: Cult Movie and Intertextual Collage," in Substance (Madison, Wisconsin), vol. 14, no. 2, 1985. Altman, R., "Dickens, Griffith, and Film Theory Today," in South Atlantic Quarterly (Durham, North Carolina), no. 2, 1989. Parshall, P. F., "East Meets West: Casablanca vs. The Seven Samurai ," in Literature/Film Quarterly (Salisbury, Maryland), no. 4, 1989. Jorholt, E., "Spil den igen og igen og igen, Sam!" in Kosmorama (Denmark), Fall 1989. Wilson, Robert F., Jr., "Romantic Propaganda: A Note on Casablanca 's Prefigured Ending," in Film and History , vol. 19, no. 4, December 1989. Gabbard, K., and G. O. Gabbard, "Play it Again," in Journal of Popular Film and Television (Washington, D.C.), no. 1, 1990. Davis, J. H., "Still the Same Old Story: The Refusal of Time to Go By in Casablanca ," in Literature/Film Quarterly (Salisbury, Maryland), no. 2, 1990. Deutelbaum, M., "The Visual Design Program of Casablanca ," in Post Script (Commerce, Texas), no. 3, 1990. Helman, A., "Dekonstruuje Casablanke ," in Kino (Warsaw), March 1990. Case, Brian, "As Time Goes By," in Time Out (London), 1 July 1992. Corliss, R., "Still Talking," in Film Comment (New York), November-December 1992. Norman, Barry, in Radio Times (London), 12 August 1995. Stackpole, J., "A Converted Classic," in Audience (Simi Valley, California), no. 188, April/May 1996. Boon, Kevin A., "Scripting Gender: Writing Difference," in Creative Screenwriting (Washington, D.C.), Spring 1997. Larson, R.D., in Soundtrack! (Mechelen), December 1997. "I have discovered the secret of successful filmmaking," says Claude Chabrol sarcastically, "Timing!" Casablanca belongs in the vanguard of films created by the era they so flawlessly reflect. Assured and expert, it is not in either substance or style superior to its director Michael Curtiz's Mildred Pierce or Young Man With a Horn. Bogart, Bergman, Rains, and Henreid all gave better performances; of those by Greenstreet, Lorre, Kinsky, and Sakall, one can only remark that they seldom gave any others. Producer Robert Lord categorized the story on the first reading as "a very obvious imitation of Grand Hotel ;" Jerry Wald saw parallels with Algiers. Both were right. Hal Wallis wanted George Raft to star and William Wyler to direct. Both declined. (There is some evidence he also planned it as a vehicle for the Kings Row team of Ronald Reagan and Ann Sheridan, with Dennis Morgan in the Henreid role. And both Lena Horne and Ella Fitzgerald had a chance at the singing part taken eventually by Dooley Wilson.) Vincent Sherman and William Keighley likewise refused the project before it went to Curtiz. Casablanca might have joined Sahara and Istanbul on the shelf of back-lot travelogues had an Allied landing and summit conference in the north African city not coincided with the film's November 1942 release. Topicality fed its fame. Curtiz, accepting an unexpected Academy Award in March 1944, betrayed his surprise. "So many times I have a speech ready, but no dice. Always a bridesmaid, never a mother. Now I win, I have no speech." The broken English was entirely appropriate to a film where only Bogart and Dooley Wilson were of American origin. Beyond its timing, Casablanca does show the Warners' machine and Curtiz's talent at their tabloid best. The whirling globe of Don Siegel's opening montage and the portentous March of Time narration quickly define the city as a vision of the wartime world in microcosm. The collaborative screenplay, signed by Julius and Philip Epstein, and Howard Koch, but contributed to by, among others, Aeneas Mackenzie and Wallis himself (who came up with Bogart's final line), draws the characters in broad terms, each a compendium of national characteristics. Bogart, chain-smoking, hard-drinking, arrogant, is the classic turned-off Hemingway American. Henreid, white-suited and courteous, is a dissident more akin to a society physician, untainted by either Communism or bad tailoring. The Scandinavian virgin, untouchable in pale linen and communicating mainly through a range of schoolgirl grins, Bergman's Ilsa succumbs to passion only when she pulls a gun on the unconcerned Rick, triggering not the weapon but a revival of their old affection. The remaining regulars of Rick's Cafe Americain, mostly accented foreigners, dissipate their energies in Balkan bickering, petty crime, and, in the case of Claude Rains's self-satisfied Vichy policeman, some improbable lechery dictated by his role as the token, naughty Frenchman, all moues and raised eyebrows. Cliché characterization leads to a range of dubious acts, notably the fawning Peter Lorre, an arch intriguer and murderer, entrusting his treasured "letters of transit" to Bogart's moralizing ex-gunrunner, a gesture exceeded in improbability only by Bogart's acceptance of them. As with most formula films, technique redeems Casablanca. Arthur Edeson's camera cranes sinuously through Carl Jules Weyl's Omar Khayyam fantasy of a set. Typical of Curtiz's work is the razor-sharp "cutting on action" by Owen Marks, a legacy of the former's Hungarian and Austrian training. He forces the pace relentlessly, even to dissolving the back projection plate in mid-scene during the Parisian flash-back, an audacious piece of visual shorthand. Narrative economy distinguishes the film. 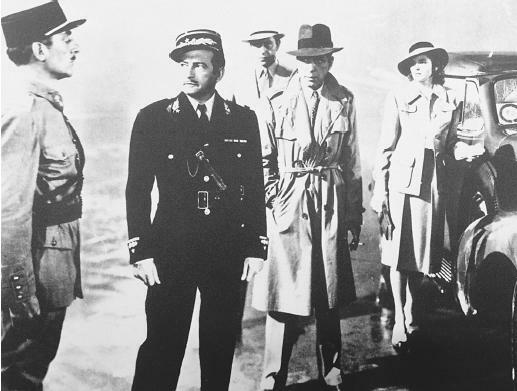 As its original material (an unproduced play by Murray Burnett and Joan Alison) suggests, Casablanca in structure is a one-set play; many events take place offstage, from the murder of the couriers to the resistance meeting attended by Henreid and Sakall that is broken up by the police. Everybody Comes to Rick's is an apt title, since it's the ebb and flow of people through the cafe's doors that gives the story its sole semblance of vitality. As an entity, Casablanca lives on the artificial respiration of ceaseless greetings, introductions, and farewells. Even the Parisian flashback does little to elucidate the characters of Rick and Ilsa. They remain at the end of the film little more than disagreeable maitre d' and troublesome patron. In 1982, the journalist Chuck Ross circulated Casablanca 's script as a new work to 217 American literary agents. Of those who acknowledged reading it (most returned it unread) 32 recognized the original, while 38 did not. Clearly this betrays the profound ignorance of the agenting community. But also implicit in their ignorance is Casablanca' s unsure standing as a work of art. Unremarkable in 1942, it rose to fame through an accident of timing. No better written or constructed today, it exists primarily as a cultural artifact, a monument of popular culture. Woody Allen was right in his Play It Again, Sam to show the film as one whose morality, characters, and dialogue can be adapted to social use; icons now, they transcend their original source. It is as folklore rather than as a cinematic masterwork that Casablanca is likely to survive.